Congrats to both of them for excellent snips! Congratulations to both Mark and Chris! Mark, I really loved all the Snivvy Crank entries and wondered if they were excerpts from longer pieces. And if so, what the premise was of each of them. I especially loved the pig woman. Chris, I noticed that all your pieces were different in tone and genre. Clearly you are a very versatile writer! Congrats to both Chris and Mark!! Great job and I enjoyed both pieces. Congrats again and good luck!! Congratulations, both of you! I couldn't think of two writers who more deserved the honor of making it to the finals. First and foremost -- congratulations on a well-deserved win to Mark! I really enjoyed all your entries, and was fully captivated by the pig-woman and Mr. Jaspers. You have a tremendous talent, and I wish you tremendous success in all your writing endeavors! Second -- thank you to the judges from the finals and to all the participants of WRiTE Club who voted for my work, offered comments and critiques, or just took the time to read my submissions! I greatly appreciate it, and I learned a lot from the feedback. I was humbled and frankly, very surprised that my writing made it to the finals -- there were some tremendously talented authors in this year's WRiTE Club! Plus, of, course, thank you again to Don and Kim! You guys did a HUGE amount of work in pulling off this marathon, and I want to say again how much I appreciate all you did! And finally let me say: I'm glad it's over, LOL! It was stressful hoping my work made it to a random bout, then watching the voting each time it was up, and then having to wait a whole week to hear the results of the finals, lol! Plus, it was very hard maintaining my anonymity at times, especially last week when everyone else got to do their reveal. Congratulations, Chris! Very well-deserved win. I enjoyed all of your pieces. Chris, if anyone deserves to be in this final round, it's you. I had a sense, though, that you'd end up here. I really did. Very, very happy for you, my friend! Congrats to the final two contestants, and to DL for all the hard work he put in this. And thanks to the judges who took the time to vote and give feedback. Congrats to you both! Great pieces! Congrats to both writers and a massive thank you to DL and his wife who both worked so hard for so long. You guys rock! Congratulations to both winners! Great job. And a huge thank you to DL, his wife and judges for working so hard to make this Write Club a success! ..and by both "winners" I mean both *writers*. Thank you so much for all the words of encouragement and congratulations. Chris, as usual, seems to have expressed so well everything I was thinking, but it really is worth saying again. Thanks to everyone who voted--especially those who kept voting to the end. As every writer knows, the only thing more helpful than praise is good criticism and I'm grateful to everyone who offered either. I'd like to send a heartfelt thanks to the judges, who gave of their time and abilities. You were the bottle of wine to this fine meal and gave the whole experience a level of professionalism which set it apart from other blog competitions. Congratulations to Chris, whose writing was so good it made the prospect of losing to him easy to bear, as were many other entries mine were pitted against. I personally would like to see Chris as a judge next year as well--I think he'd be great at it--but then we'd be prevented from seeing more of his work and critiques throughout. It's a sort of catch twenty-two either way. I've got one final thanks sitting here waiting to hand out and it's unfortunately way too big to fit properly in a comment section of a blog--like trying to stuff the Pig Woman into spandex. It goes to Don and his wife Kim for doing what must have felt at times like being the wedding planner at a party. If only you two knew the ripples your selfless work will have in the writing careers of many participants... I, for one, know that because of this contest I will be renewing my commitment to writing with the determination of trained fighter. Thank you for creating such a contest where writers can celebrate little victories in their writing lives. Thanks again, on behalf of Snivvy, for everyone who was a "fan" (Suze and Diane--that means you). 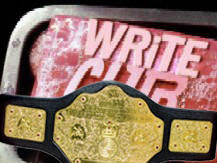 I look forward to judging next year's Write Club and to seeing every entry in the Write Club ring...where it doesn't matter what you bench press and only the bruised and battered are left standing. Congratulations, Mark! Your pieces were excellent. Mark, I remember your remarks on my piece, which lost in round 8, with deep appreciation. You deserve this 'win,' but may it be only the beginning for you. You are enormously talented, brimming with wit and have such an impeccable grasp on all the variables that have to brew just right. I raise my mug of coffee to you this morning. Well-deserved and well-done. I'm very pleased to discover the excellent 'Snivs' was you. Congratulations Mark, you survived and won. Great job! Congrats to all the entries and to the winner! Note - Your feed looks excellent! It must have worked! You still have it set to only showing a snippet, rather than the whole feed, but that's your call, and I'm glad it wasn't showing as garbled text! Woot! Wow, huge congrats to everyone who participated, to you for making it such a success, and to the winner! I'm sorry I wasn't around more to vote. Congrats, Mark and Chris. Making it into the final two is fantastic. I enjoyed both writers' pieces. Congrats, Mark, for winning the whole show! Congrats to both fellas. Thanks for the chance to read your wonderful words. I have to admit that I had my suspicions about you, Chris, when you didn't come forward last week. ;) And Snivvy Mark - excellent, consistent performance the whole way through. We wants more Pig Woman!!! First of all, thanks to DL and wife for such a huge effort this must have been! Congrats to Mark on the win. I couldn't have chosen better writers to be finalists than Chris and Mark. Congratulations to you both! Congrats to both but especially the winner! The big reveal! How exciting. Congrats to you both for some fine writing! Congratulations Mark and Chris. A big pat on the back for DL and his wife for hosting this writing fest of awesomness! Congratulations to both Mark and Chris. As this competition had illustrated, you guys have talent out the wazoo. And of course, thanks to DL & his bride for all their hard work. Congratulations, Mark - and all the finalists! Congratulations to Mark and Chris - both talented writers! Great commentary by the judges too! Awesome. Congrats to the winners. that was incredible! congrats!! thanks so much, DL for all your work! Congratulations to both Mark and Chris. Awesome work. Huge congrats, guys! What a wild ride to the top. Congratulations to two great writers. A huge thanks to DL, his wife and the judges who all donated their time to this great competition. Congrats! to Snivvy Crank and all the participants! I signed up but life soon overwhelmed me. I'll try again next year. This was so much fun, I'm glad I got to participate and cheer from the very beginning. Congrats to Chris and Mark. Also, you deserve a high five for orchestrating such a terrific event!! WOW, what effort on everyone's part. Impressive!